An American Tail was one of Don Bluth's best, restrained by a simple but coherent narrative and centred on a very cute protagonist. So it makes sense that it got a sequel. However, as with other successful franchises he kicked off, the second theatrical American Tail movie - as with the TV series and direct-to-video follow-ups - had no involvement from Don Bluth. 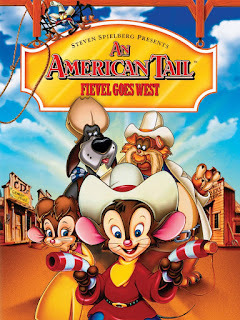 Fievel Goes West, while successful, has the feel of contemporary Disney sequels. Unlike Pixar's follow-ups, these tended to be rather cheaper and less impressive than their predecessors. 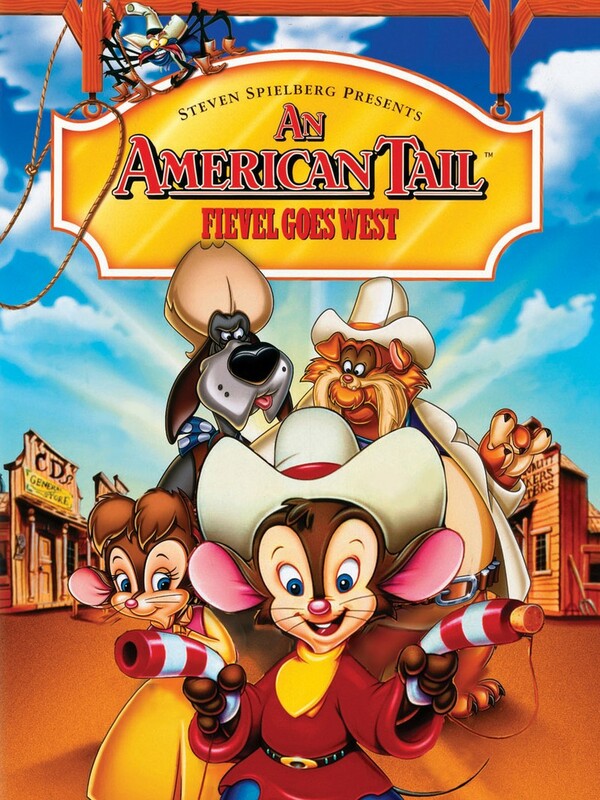 So it is with Fievel Goes West - while it has elements on the premium side, like voice acting from John Cleese and the final performance from James Stewart, as well as some ambitious action sequences, overall everything is just shallower, less well-executed and less believable. The original has a simple set-up with plenty of grit and misery to balance the cuteness and light. The sequel is just a bit too silly to carry the torch. One significant positive is that Fievel's character developed in a believable way. He's grown up a little since the first movie, with more confidence and even headstrong selfishness. It works, and aligns well with his burgeoning interest in cowboys. Perhaps the most crucial problem is that the sequel lacks a sense of danger. A spider doesn't seem like it should be a threat to anyone, even a mouse. While Cleese's character is compelling and believable, his ultimate plan is too stupid for any situation beyond a Saturday morning cartoon. And in particular, Tiger's storyline is far-fetched, at times racially insensitive and ultimately doesn't bring enough gravitas to a final action scene - especially with little Fievel participating. Overall, Fievel Goes West is not a bad movie. It's perfectly watchable and better than other Bluth-movie sequels, especially the execrable Timmy to the Rescue. But it doesn't quite manage to escape that feeling that it's been thrown together by writers who don't care for the material and only want to retread familiar old story paths, takes the slapstick too far in a way the original didn't, and doesn't give enough reason to care about its characters. Not a worthy sequel, but not a dire one either.